I don’t know about you, but it feels like the holiday season is flying by and it’s only just begun! Are you feeling that way, too? If so, here’s a simple gift idea that takes only a few minutes to put together, but feels special and handmade. I’ve shared this idea before, but wanted to bump it to the top again this year since it’s such a popular gift idea. 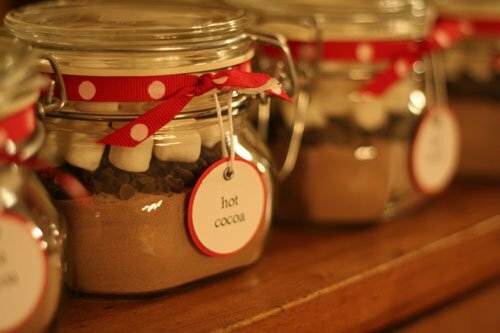 Hot chocolate in a jar makes a terrific gift for teachers, coaches, neighbors, co-workers or friends, anyone you want to give a little something warm and sweet. My teenage daughter has even given this as a gift to her friends. Here’s a quick run-down on the supplies I used and how I put the jars together. After printing out the tags I used two circle punches to form the circles. (The back, red circles were about 1/4″ bigger than the white circles.) I glued the red and white circles together using glue stick. Next, I used my Crop-A-Dile to punch a small hole at the top of each tag and add an eyelet. After the first failed “make-your-own-hot-chocolate” experiment, I decided to go with something tried and true. Stephens has been my personal favorite hot cocoa for years (since 2007 actually), and so I thought it was the perfect cocoa to share with family and friends. I measured enough cocoa to have complete servings in the jar (such as six servings per jar) but left room on the top of the jars for mini chocolate chips and mini marshmallows. After adding the cocoa, I shook the jars back and forth a bit to make sure the layer was flat in the jar, and then added the chocolate chips and mini marshmallows on top. Once the jars were full, I strung a ribbon around the top and tied on the tag with white embroidery floss. Here’s one more look at how they turned out. Let me know if you have any other questions about this project. Thanks! P.S. We’ve just opened up enrollment for our January Organize-athon! Hope to see you online soon. Aby, these are so cute. 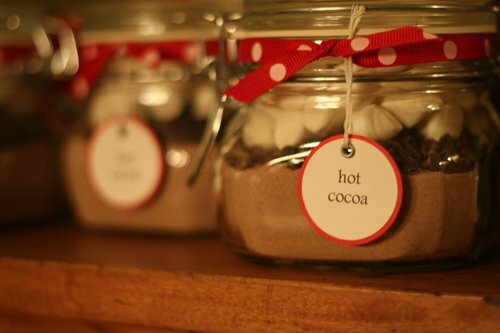 What time saver to use pre-made hot cocoa mix! Thanks for the recipe – definitely keeping this one for next Christmas! What oz size jar did you use? The ones shown in the photo are the 16 oz jars. I also did some little ones (7.75 oz) and the big ones would work great, too! I like the simple idea of glueing 2 circles together to create the red rim. I pinned similar ideas so I’m a fan ;-)). Such a cute idea, and as usual, you’ve made it really pretty. Thanks! This sounds delicious for my daughter who teaches high school, my college grandchildren. Where do I find Stephan’s chocolate mix? Hi Kathryn! Great to “see” you. You are correct…it is a powdered mix. Anything will work but you might have to change the directions that you provide to the recipient based upon the mix that you purchase. We’ve tried a few mixes but really like the Stephen’s. Hope you’re doing well! I’m always lurking – and still a batch of us at the old goals forum going strong. They came out cute …..